Next Coffee with Cher: Thursday, December 13 at 10am —What Kind of Shoe Are You? Join us on Thursdays where Events To Remember will be hosting weekly lifestyle workshops for moms. 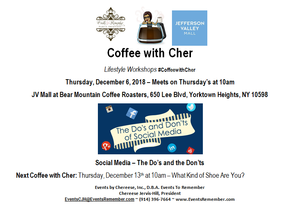 Chereese Jervis-Hill will be presenting "Coffee With Cher" from 10AM - 11AM weekly right outside of Bear Mountain Coffee in Center Court. These weekly in-person lifestyle workshops which will include field trips around the mall, coffee and treats, coupons and special offers and interactive fun for Yorktown Mom's in the surrounding Jefferson Valley Mall area.